Here's a classic that never goes out of style. A beautiful, full, 22" Hibiscus, forever captured in full bloom, in a decorative hanging basket. 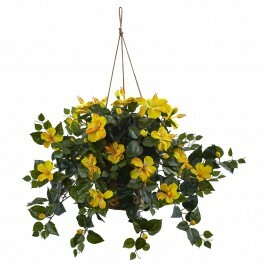 You'll love the "sunny" look of the blooms against the backdrop of lush greenery as they delicately hang down. Never needing water, this selection looks great anywhere - home or office, and also makes a fine gift. H: 7 In. W: 9.75 In. D: 9.75 In.